Little tiny plants that make you want to bend over and see them more closely. Bigger plants that hide the curve a bit and make you want to see what is at the other end. Walking down the path in the early morning through the dappled shade. Ambling down the path in the twilight, with just a few twinkling lights to show you the way. On Easter, when Auntie Carol is hollering out "stay on the path" as her neices and nephews scurry about the garden looking for Easter eggs. Of watching the path disappear beneath the snow in winter and then have it reappear in spring, lined with tiny little spring ephemerals. I can see it now - it's going to be charming! If you need any wild ginger, just let me know, I've got plenty to share. That is going to be lovely! Keep updating with the progress please. I have path envy! To create a woodland path from scratch - what a lot of work and opportunity! It will be lovely! 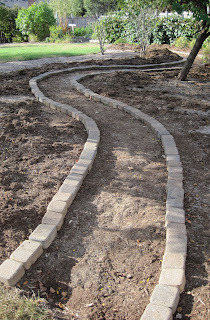 I recently started a new path in my woodland garden and my mind turns with the possibilities. Happy gardening with yours! Carol, a ways to go but you are on the right path. Be watching for the finish. Bet you are too. I love a path, it showcases all of your favorite plants and shouts at you to notice each and every one. oh boy - I can feel the excitement!! I can't wait to watch this unfold. Now that's one helluva path there! Your space is already pretty large, but this path looks as if it can do a neat trick: make the yard look bigger while at the same time making it feel more intimate. I can see it now. It will be marvelous. It will have a life of its own. Fairy conventions will be held here and there most often around the bend where prying eyes can't see them. Neat! I can see it coming together! I can imagine skipping along the path. It flows with grace. Now I am offically envious. When we moved in three years ago my first goal was to plant trees so that someday I may have a woodland path as well. I can't wait to see your develop! I'm in love with pathways... this one is coming out beautifully! I love that shot — it makes your garden look like a huge park!